Music does play a very important role in our lives. Not only does it allow us to convey our happiness but also lets you calm down. Music is one of the best and most wonderful ways of expression these days. Whether you are an artist or a recorder, how will you get work in this field? Find out in today’s post. But before we do that, we would also like to inform you that music related careers is all about having talent and using your creativity. If you are willing to do that again and again, the jobs here will definitely take you a long way. Take a look! The following mentioned are few music industry jobs or careers in music industry for those who love music. The first job that comes under the category for singing. This is especially for those people who have a great voice and love choosing a career out of it. Although it is slightly hard to become a good and well paid singer, you can still keep trying before you make it to the job. The job description of a singer includes having your focus on the performance. You have to back yourself up with a guitar or a piano or do some sort of dancing or singing to keep people hooked. There are several singers who have recorded albums and songs. They also have a production team that helps them get more famous and allows them to learn more about music. But you have to be well paid to be able to afford that. A second music industry career you can make out is by becoming a song writer. Your duty here is to make and create beautiful songs for the commercial world. At least you will be expected to make music that will support your income before you get popular. Most song writers have to write the melody as well as the lyrics and you might be expected to get the pieces ready for the singers as well. It is a tough job but totally worth it for those who want to sing. If you guys didn’t know, lyric writers actually can make a whole lot of money. Some of the lyric writers are so rich, they end up having more than hundred thousand dollars at the end of each project. It will all depend on who you will work for. The only con with lyric writers is that they are self employed who pitch to several publishing companies. They often work alone in order to create song lyrics in film, television, music, commercials and what not. Lyricists can make it big if they have what it takes. A club Dj is perfect for those who like to party and love dealing with crowds. Those who are successful can make up to thirty thousand dollars on an average per year. Getting three hundred dollars per night is quite a normal thing for them. The job description of a club DJ is quite simple. They have to produce new music and mixes under their own name if they want to stay competitive. They should also have deep and proper knowledge on music so that more people want to dance. A cruise ship musician is someone who will work for the cruise line. They have to perform music in several areas of the cruise and get paid according to the hours. Cruise ship musicians are often needed in lounges on ships and swimming pools. They make somewhere between twenty four to forty two thousand dollars per year. Some of the jobs that fall under this category could also include a piano vocalist, a lounge duo, lounge band, orchestra musician etc. Those who work as cruise ship musicians are expected to know musical instruments like piano, guitars and bass. Another great career or job in the music industry is becoming a part of a show band. These guys also make a whole lot of money. So if you have friends who love music as much as you do, try to see if a band can be brought together. Being a part of a show band is all about hard work after all! You guys will be the entertainers. From performing at hotels, casinos, clubs and halls, you have to put on shows at night clubs, cafes, bars and concert halls. They are not just considered as entertainers but also performers. Some of them also use dance to make a lot of money. A recording group is also known as a recording artist and these guys are capable of making a whole lot of money. They record music in a professional manner and are expected to have a good idea on all kinds of music such as rap, classical, jazz, country, pop, folk, classical and every other genre that falls under this category. There are several groups that begin as bar bands and performs in small venues after which they make it to big recording companies that help them perform songs they have written. A sound designer is also known as audio engineer, audio artist, sound artist etc. these guys are expected to provide audio support and create sound or design them for the creative sound designer. You will also be able to make a whole lot of money that too somewhere between forty to a hundred and twenty thousand dollars approx. The average salary is seventy one thousand dollars. A session musician, also known as a studio musician makes somewhere around sixty four thousand dollars a year. With time and experience it can also go up to a hundred thousand dollars too. These musicians are expected to back other artists when they are performing live in a studio. The person has to be aware of different genres and should have good knowledge on music. They also need to have good day to day administrative talks like simple accounting or even staying in touch with the other musicians. A rockstar happens to be a member of some rock band who becomes the focal point of the group at a certain point. They are also the front man or the front woman of the group and are expected to present the band as if they are the representative or the spokesperson of that group. They must also contribute significantly towards the team in order to promote the image of the band. Also a rockstar is expected to write songs, perform them and also serve as a mouthpiece during several interviews. Rockstars can make somewhere between a hundred thousand dollars and one million dollars per gig. A composer is someone who knows everything about music. These guys begin to work from their computers in recording studios by using software such as Logic Pro, programs and score and also confirm music to picture edits or even Producer mandated changes in the direction of music. The composers also depend a lot on the sample libraries although those who are working on the big projects often have to be able to hire more musicians for live instrumentation. Music Journalists can also work as editors. These guys should have a good idea on both knowledge and journalism. They have to build their portfolio of clips and try in prestigious institutions, Experts who have become music editors have been in charge of reviews. From music editor, he also has features and duties where he has to meet rappers and prepare questions and answers for them. It is all a part of their job. Music journalists also make decent money. They start off with fifteen thousand dollars and it goes up to thirty thousand with a little more time. Those who made it big are earning in millions now. A radio DJ is also popularly called a radio personality, dj, on air personality and co hosts. They start off with twenty eight thousand dollars a year and that could go up to a hundred thousand dollars too, depending on how rich and talented the person is. The job of a radio DJ is also very simple. They are supposed to play music on air, discuss new music and other subjects between songs too. Plus they are on air personalities who have to play and mix music and be very clear and fluent while speaking. Music therapists work with people of all ages. From children to elderly patients who are suffering with mental health problems, disabilities and brain injuries. They also use musical performance, lessons and song writing to become an important part of an integrative course of therapy in order to improve the clients physical, emotional, social and cognitive abilities. Music therapists also work in several ranges of settings and also visit schools and special education programs if the need arises. Some of them have to work with counsellors, doctors, nurses, speech therapists etc. A music director is expected to work in a radio station. His work is to find good music for the station. The job helps them make somewhere between twenty five to ninety five thousand dollars a year although the assignments are not easy as they look. Picking good quality music can be a tad bit complicated and tricky therefore a music director can always help. The job is to make sure what is available to you, what the audience wants to listen to, what can help you get the best ratings and what can help the sales department make more money. Just like the name suggests, a music teacher is taught to appreciate and teach the value of playing music. The position will also let you pass the music passion you have within you to others. Music teachers usually teach in schools but if you want to become a professor, that could also happen but it is important to get a proper degree in music. There are plenty of music teachers out there who are happy with their jobs. We bet you will be too if you take this one up! Remember Two and a half men? The job that Charlie Sheen’s character would do? Making doodles and fun songs for commercials? That is the job of television music writers. The good thing about these jobs is that it also helps you work in the world of movies and tv soaps. Being a jingle writer is actually full of fun and can help you fetch a whole lot of money. Those who have been working in this field for years have made up to twenty four thousand dollars a year or even more. The person however must have some amazing knowledge on music and should be creative enough. This job is perfect for those who can sing but do not want to be before the audience. A background singer is someone you will always find in music tours. They sing behind the main singer and help the whole piece of music sound illustrious and beautiful to the ears. You will also find this in some of the music videos. Remember When we were young by Adele? There were some background singers at the back. And apparently they make quite some good money if they work regularly. This brings the post to an end. 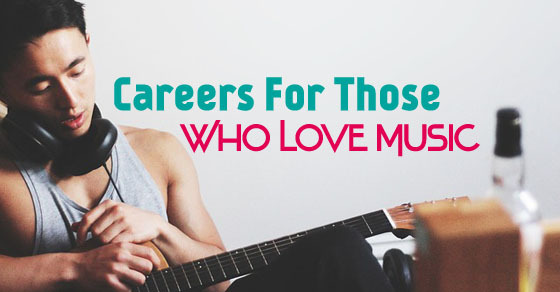 If you want to choose career involving music, these are some of the best choices we have for you. Make sure to go through all of them thoroughly, talk things out with your near and dear ones before you make the final decision. On that note, good luck and here’s hoping you have a fabulous and flourishing career in music. Also keep in mind that we are waiting to get some of your comments and feedback. So do write in to us about it. Your questions and doubts are important to us and it would be an honour to answer all of them.